In this article i have explained how to automate word applications with the help of VB.NET, Many peoples are not aware of COM interop applications, this is a basic article that gives idea about the word automations. In this article we are going to deal with Word interop objects. we can automate word files using this interoperability. to automate word programmatically we need to add it's word interop assemblies. 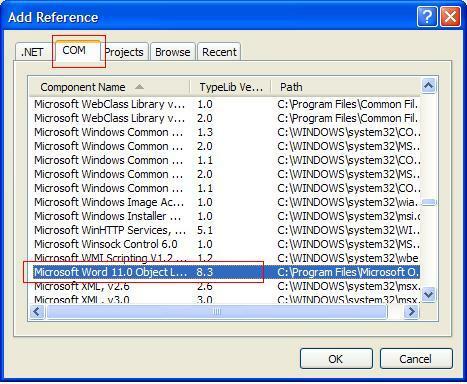 new window will open go to COM tab and select "Microsoft Word 11.0 Object Library" if you have 2007 then you should select "Microsoft Word 12.0 Object Library"
yes, we import namespace now start with the actual operation. here is our first task to read content of word file. collect the object from meory. for this perticular code i have used Close() and Quit() methods to dispose word objects. Word automation may slow down the system processes. The document I have created is more than one page, how do I position it at the top when the Word document opens for editing ? I need to add more than one Hyperlink in a document. When I do, it appears at the top and there is no spacing between them. Is it possible to space them apart or put one on the next line, within a sentence. What you want to keep your position it at the top of the page ? do you want to keep your cursor at top of the page when document open. You have added more than one hyperlinks in your document right ? now you want to put one on the next line using program, but why don't you put them initially on separate line. I mean if you place them manually in document then you can place them in a specific position you want, why you need program for it. sPara2.Range.Text = "This is my hyperlink"
sPara2.Format.SpaceAfter = 24    '24 pt spacing after paragraph.